Whistler is known worldwide for great skiing, a high-speed lift infrastructure and a vast array of off-slope activities and facilities. When will it snow in Whistler Blackcomb? The next notable snow forecast for Whistler Blackcomb is 6cm2in, expected on 27 April, with around 9cm4in forecast over the next 7 days. How High is Whistler Blackcomb? The Canadian Ski Resort of Whistler Blackcomb has direct access to 216 marked pistes, served by a total of 33 ski lifts. With ski lifts as high as 2,280m7,480ft, snow cover is generally reliable. Over the past 30 years no resort has hit the winter sports world headlines as often as Whistler in British Columbia. Coming from way down the world rankings the resort shot to the top of the reader survey popularity charts in North American consumer ski magazines in the early '90s, and has stayed there ever since. Not only a North American phenomenon, Whistler has pulled in package tour operators from all over the world by the dozen in recent years and topped 'favourite foreign resort' polls in countries like Japan. Whistler hosted most on-snow events (except snowboarding, ski-cross and frestyle) at the 2010 Vancouver Winter Olympics, fulfilling its creators dreams 50 years earlier of creating a resort to host the Olympic Games. It now attracts more skiers and 'boarders than any other resort on the North American continent. The resort began life as recently as 1966, with its 'municipal inception' a decade later. Since then an incredible 2.7 billion Canadian dollars have been spent making the resort what it is today. The reasons for the unprecedented enthusiasm in Whistler today are many. Perhaps you start with the fact that North American ski resorts are recognised as having the best service standards and lift systems in the world, then you consider that Whistler has the best lift system in North America, with the most high speed lifts in the world. Secondly you might add in to your musings that Whistler has not one but two mountains, Whistler and Blackcomb, lift-linked together, providing the biggest ski area in North America. Oh, and these two mountains also have one-mile of vertical, which is some of the largest lift accessed terrain in North America. Indeed the 'Blackcomb' effect can't be overstated. Originally developed by Intrawest in the mid 1980s, their first major ski resort project, it provided valuable competition for Whistler mountain for well over a decade before the two came under joint Intrawest control. Whistler is big enough to ensure a vast range of choices on and off the slopes when you're not riding up and sliding down the slopes - around 100 restaurants and 200 shops plus a huge choice of accommodation (more of it slopeside than anywhere else in North America) and activities. Finally there are little things like the proximity to a major international airport; the favourable exchange rate of most countries, including the US, to the Canadian dollar; the status of having the only lift-served summer glacier skiing in North America; the uncrowded slopes; the vast choice of terrain. Of course the residents and fans of Whistler will tell you that these are just the ingredients, and it's that 'something else', the feel of the place, that makes it truly great. The only negative factor that any critics, desperate to find a flaw in the apparently nigh on perfect ski resort, can find, is that its low elevation and proximity to the Pacific can mean rain rather than snow at base level at each end of the season. Whistler's view is that the low base is a boon because, although they have some of the biggest verticals in North America, the top elevation is not as high as resorts in Colorado, so altitude sickness is not a danger for Whistler's guests. The proximity to the coast also means that it doesn't get overly cold - just cold enough for an average 33 foot dump of powder each season. The longest possible descent in Whistler Blackcomb is 11km7 miles long and the most difficult run is the 'Couloir Extreme (48 degrees)'. Together, Whistler and Blackcomb mountains have the largest ski area in North America, with just over 8,000 acres of skiable terrain and more than 200 marked trails. Both mountains divide terrain, lifts and acreage relatively equally. In addition to the pisted terrain there are a dozen huge Alpine bowls including three with glaciers. The area's lift system includes thirteen high-speed quad chairs, four gondolas that are faster still and there are five different base areas from which to access it all. Despite having the most skier/'boarder visits of any North American resort this powerful lift system has helped the resort win awards for also having the shortest lift queues. There's a vast choice of terrain of course, steep powder chutes, challenging mogul fields, secluded tree skiing and endless smooth groomed cruisers. Runs are up to 7 miles (11km) in length on both mountains. Beginners have easy trails and dedicated learner areas directly above Whistler village and can ride gondolas or chairs up one of the mountains to take an easy run down. About half the terrain is ranked intermediate and there can be few better choices for non-stop opportunities at this level of skiing. On mountain, Expert skiers have around 60 black trails on piste to enjoy, more than almost anywhere else, including the Couloir Extreme run on Blackcomb mountain, with a 48 degree pitch. Experts can also opt for heli-skiing excursions, enabling them to clock up 8 - 10,000 feet (2500 - 3000 metres) of virgin powder. A range of packages including heli-orientation, guide services - and even gourmet lunches is available. Whistler has a wide variety of specially designed tuition programs. Ski and Ride Esprit is designed for all levels of skier wanting three or four or five days of tuition in a group. There are also Women Only ski and snowboard classes and Dave Murray Ski Camps using state of the art demo skis for intermediate to advanced level skiers who wish to chalk up around 5 hours of on-hill training per day in a fun atmosphere. Daily group lessons and private classes are of course also available. Apart from downhill skiing and 'boarding, guided back country powder tours are offered through Whistler Alpine guides. In addition, there are 87 kms of cross-country trails available in and around Whistler Village (55km at Whistler Olympic Park and 32 kms Lost Lake). Great 'boarding terrain just as it is for skiers, with all possible on-piste experiences available as well as back bowl 'boarding, heliboarding and summer 'boarding on Blackcomb's Horstman glacier. The resort is extremely snowboard friendly, with tuition available for kids age seven and up, one day camps for new arrivals and, of course, high speed quad chairs and gondolas all over the place - making the ride up easy. There are five terrain parks and 1 Superpipe on Whistler and Blackcomb mountains. The highest level terrain park extends to 26 acres and includes full features such as jumps and kickers. Numerous events are staged throughout the season. From January through to March there are weekend 'boarder competitions on both Whistler and Blackcomb mountains in Half Pipe, Slopestyle and Boarder Cross categories - these are open to pros and amateurs of all ages. When is Whistler Blackcomb open? We don't currently have confirmed season dates for Whistler Blackcomb. Usual opening is late November, and usual closing is Late April (Glacier skiing continues in to May and early June and is then usually available again in July.). NOTE:- Lift and Piste openings are always subject to Snow Conditions in Whistler Blackcomb. Whistler Blackcomb is able to make snow, with 259 snow cannons. The 33 ski lifts of Whistler Blackcomb are able to uplift 59,007 skiers and snowboarders every hour. Whistler Blackcomb is in Whistler, Squamish-Lillooet, Canada. The nearest airport to Whistler Blackcomb is Vancouver International which is 128 minutes drive away. There is lots going on throughout Whistler resort every night. There are movies, moonlit cross-country skiing and horse-drawn sleigh rides. Swimming is also an option at the Meadow Park Sports Centre. For lovers of the normal pubs and clubs scene, Whistler boasts many popular spots including Garfinkels, the Savage Beagle and the Longhorn Saloon. Whistler has a micro-brewery, with free tours (and samples!). There are numerous special events throughout the season; in February the annual Whistler Gay Ski Week is held. The biggest event of the year is the annual TELUS World Ski & Snowboard Festival, North America's largest winter sports event, which runs for ten days in mid-April each season. In the '90s Whistler was repeatedly voted 'Best North American Ski Resort' by North Americans, and in Japan was voted the favourite international destination for Japanese skiers. Want to Know when it Snows in Whistler Blackcomb? 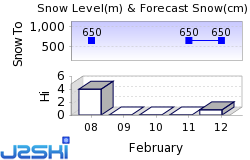 Click above to get Snow Reports by e-Mail for Whistler Blackcomb. By doing so, you agree to Our Rules. Want to ask about skiing and snowboarding in Whistler Blackcomb? Or contact Whistler Blackcomb Tourist Office.